Alt-rock pioneers Garbage are delighted to announce their return to Australia this November, touring in celebration of their acclaimed sixth studio album Strange Little Birds. 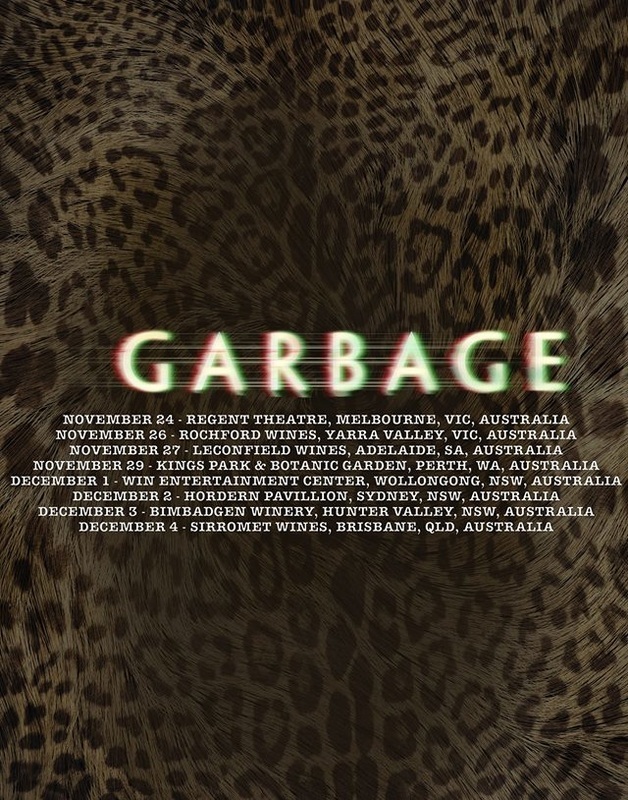 These will be the Garbage’s first Australian shows since 2013 and first Wollongong show in 17 years. Joined by Melbourne’s own Tiny Little Houses as special guests, Garbage will play Melbourne’s Regent Theatre on Thursday 24th November and Sydney’s Hordern Pavilion, with Olympia on Friday 2nd December. In addition to Melbourne and Sydney indoor headline shows, Garbage will play a series of A Day On The Green outdoor concerts with The Temper Trap, The Preatures, Tash Sultana and Adalita. Rounding out their tour Garbage will also perform a show at Wollongong’s WIN Entertainment Centre on Thursday 1st December, joined by special guests The Temper Trap and Tash Sultana. To create Strange Little Birds, their first album in four years, Garbage drew on a variety of influences including the albums they loved growing up. Upon its June release, the album debuted at #9 on the ARIA Album Chart and picked up acclaim from the likes of Pitchfork, The A.V. Club, NME and Spin amongst countless respected critics. All eleven tracks on Strange Little Birds were recorded and produced by the band (Shirley Manson, Steve Marker, Duke Erikson and Butch Vig) and released via their own STUNVOLUME Records/Liberator Music. In support of the album’s release, Garbage performed a powerful two-song performance on Jimmy Kimmel Live! , playing Empty and Push It. From their lauded self-titled debut (1995) through to Strange Little Birds, Garbage’s innovation, unique sound and provocative visual aesthetic have inspired massive worldwide attention and success. Tracks like I Think I’m Paranoid, Only Happy When It Rains, When I Grow Up, Stupid Girl and Cherry Lips are instant classics and highlight the band’s talent to span genres and styles while still staying true to their celebrated sound. World renowned for their incredible live rock shows, Garbage have sold 12 million albums worldwide, performed in over 35 countries and continue to perform sold out shows across the globe more than two decades since their formation. These shows will be Australian fans’ first opportunity to hear songs from Strange Little Birds live alongside favourites from Garbage’s hit-filled career. With anticipation for this tour at fever pitch, tickets will not last long - don’t miss out!